On Monday night, President Donald Trump and his eldest son, Donald Trump Jr., both weighed in on the controversy involving MAGA hat-clad teens from a Kentucky Catholic school, a Native American activist and a black separatist group known as the Black Hebrew Israelites. In a tweet, Trump wrote that the students were "treated unfairly with early judgements proving out to be false — smeared by media." The president tweeted again Tuesday morning, calling Sandman and other students "symbols of Fake News." Then, on Fox News' "The Ingraham Angle," Trump Jr. told Laura Ingraham that the media "had to pounce" on the teens because the narrative of racist kids wearing Trump's signature campaign memorabilia and displaying contempt for a Native American elder was too good to pass up. "They want a bunch of nice Catholic kids — happen to be white — they want them to be the enemy," Trump Jr. said on Monday. 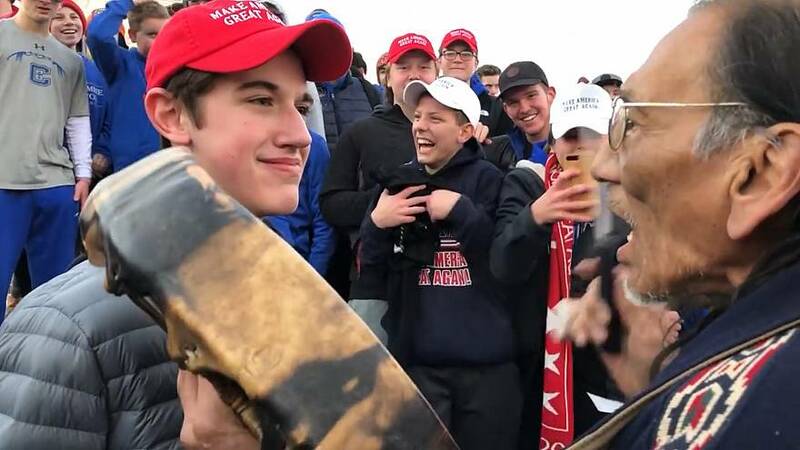 The controversy blew up after footage of Native American activist and Vietnam War veteran Nathan Phillips playing a ceremonial drum in the face of MAGA hat-wearing teen Nathan Sandmann as his classmates chanted around him went viral over the weekend. The exchange took place on the steps of the Lincoln Memorial in Washington, D.C. Sandmann and his classmates from the all-male Covington Catholic High School in Park Hills, Kentucky, were in town for the March for Life, while Phillips was present for the Indigenous Peoples March. Social media observers highlighted Sandmann's reaction to Phillips — a grin many took to be contemptuous — to be proof that he and his classmates were mocking Phillips. Videos showed that Phillips approached the crowd of boys, many of whom were wearing MAGA hats, after an exchange between the high school crowd and a group of Black Hebrew Israelites. The latter group had thrown raunchy taunts at the much larger group of teens, who responded by engaging in group chants. Speaking with MSNBC's Joy Reid on Sunday, Phillips said the Black Hebrew Israelites had targeted his group for abuse too, adding that he approached the teens after witnessing their exchange with the group. But Phillips said some of the students began chanting "Build the wall" and other comments he and his fellow activists found offensive. On Sunday, Sandmann released a statement through a public relations firm detailing the death threats he received after the footage went viral. Sandmann said he and his classmates responded to the Black Hebrew Israelites with school spirit chants "to counter the hateful things that were being shouted at our group." Sandmann insisted "at no time did I hear any student chant anything other than the school spirit chants." "I did not witness or hear any students chant 'build that wall' or anything hateful or racist at any time," he said in Sunday's statement. Sandmann said Phillips "locked eyes with me and approached me, coming within inches of my face." "He played his drum the entire time he was in my face," Sandmann said in his statement. "I never felt like I was blocking the Native American protester. He did not make any attempt to go around me. It was clear to me that he had singled me out from a confrontation, although I'm not sure why." School administrators said they were investigating the incident. Classes were canceled Tuesday as Native American activists planned a protest outside of the school.